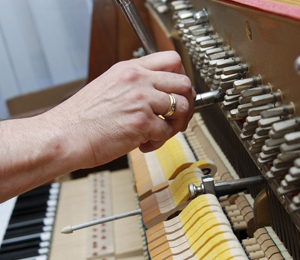 Tuning, Reconditioning and Restoring Pianos in Metro-Detroit is our specialty. Superior Service at an Affordable Price Since 1977. Cruce Piano Tuning is available to tune, repair and regulate pianos in Birmingham, Rochester, Troy, Novi, Sterling Heights and all the surrounding areas. Terry graduated from the prestigious Perkins School of Music and has 40 years experience. Whether your piano is well maintained or hasn't been serviced in a decade, he will leave it sounding great. Let us get your piano sounding like the first day you played it! We possess decades of piano moving expertise for all kinds of pianos—from upright to grand pianos. We are technically equipped with the proper quantity of experience having one goal to move the piano to the targeted area securely and safely under every condition. We are often asked to do a piano estimate or evaluation for repairs. This is one of the most important steps an owner can take in order to insure that they are spending their money wisely on an instrument, and whether or not a restoration should even be performed. In the course of an evaluation, the piano is looked over closely for its current condition and its potential for restoration. Based on these examinations, a rough estimate of the instrument's current retail and wholesale value are determined, as well as the costs for restoring the instrument to the highest level of the customer's expectations. 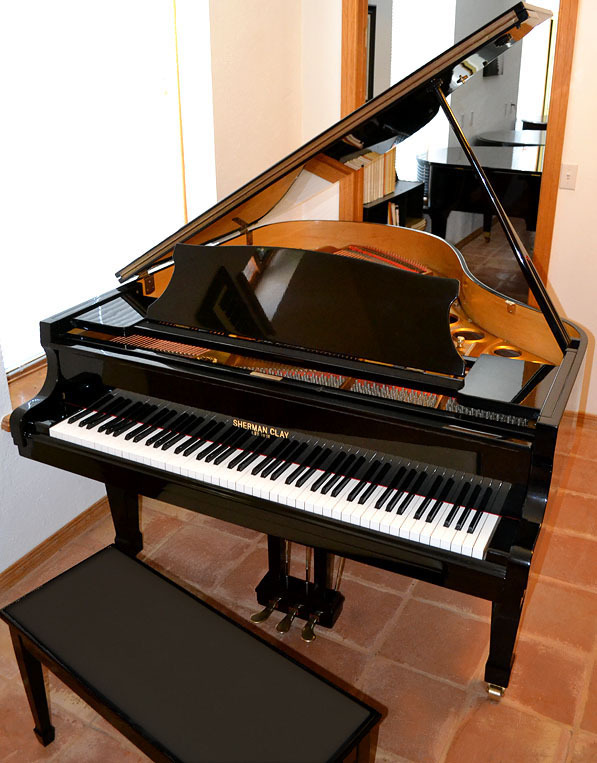 We have delighted over a thousand piano lovers with our rebuilding and refinishing services. Whether you live in Grosse Pointe, New Baltimore, Commerce, Rochester or the surrounding areas, we will restore your piano to better than new for less than you would imagine. As a professional piano tuner Terry can accomplish any "in-home" repairs or even take your piano with him to do more extensive work. If your piano needs rebuilding Terry can consult with you about the best approach as well. Our piano services feature everything related to pianos, including the sale of pre-owned pianos, We also buy used pianos in West Bloomfield, Shelby Township, Plymouth and the surrounding areas. I've used Terry to tune our Webber upright piano for several years now and he has always done an excellent job. He even was able to fix a few broken springs in the action of the piano to return it to service and has always provided great advice and suggestions for keeping the piano in top working order. I've been very pleased with his work and will continue to use him twice a year for our tuning and highly recommend him to others. Just a short not to say thank you for the way my piano sounds and plays after your tuning and yesterday WOW. I can't believe the difference you made. Regular maintenance on your piano will keep your precious instrument playing like the day it was new for years to come. The piano experts at Cruce Piano Tuning Services extend their piano repair skills to all the cities and towns in South Eastern Michigan. 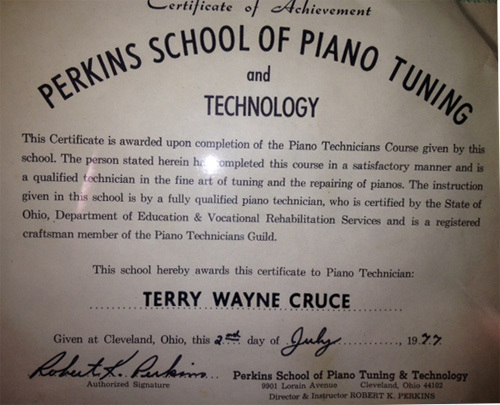 Terry Cruce graduated from the prestigious Perkins Trade School of Piano Tuning and Technology in 1977 and has been helping to bring music into happy customers' lives ever since. A great number of the very best piano technicians in the United States were trained at this trade school. We proudly offer any and all service your piano needs, including: Tuning, Repair and Regulation, Complete Piano Cleaning, Piano Moving, Used Piano Sales, Player Pianos, Restoration, Restringing. Let us get your piano sounding like the first day you played it. Contact Cruce Piano Tuning Service today to schedule an appointment. We look forward to helping you. 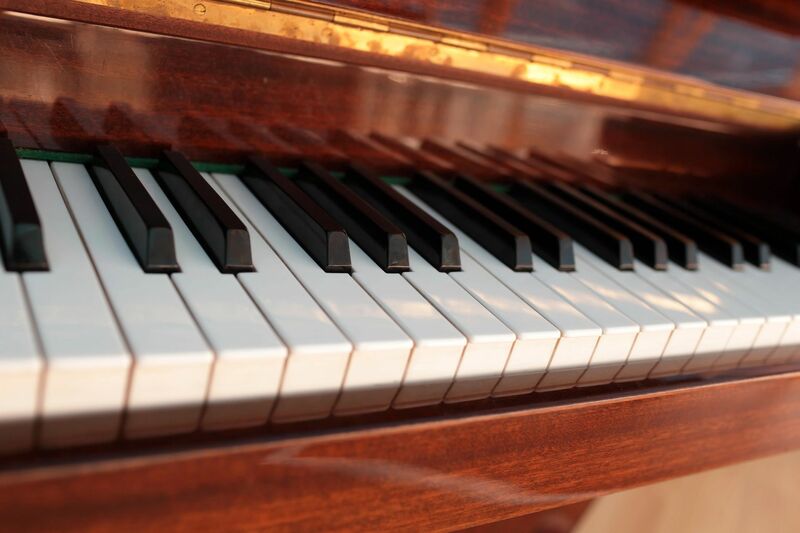 Tuning, reconditioning and restoring pianos is our specialty. With so many variables to consider, no pricing is given over email.